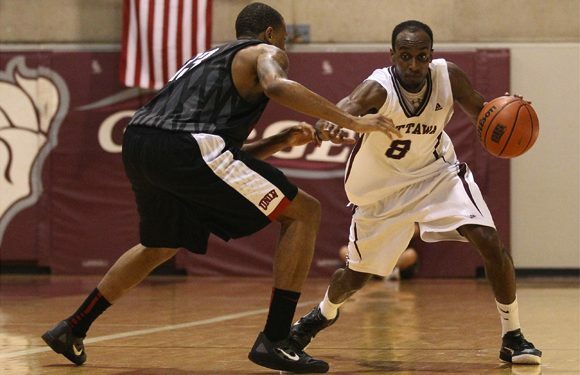 OTTAWA, ON– The UNLV Runnin’ Rebels are 2-0 on their Canadian tour after downing the Ottawa Gee Gees 89-76. The victory came less than 24 hours after UNLV escaped with a narrow 74-70 win over CIS powerhouse Carleton. A surprising first half saw the Gee Gees go into the break with a 45-42 lead, largely thanks to the shooting exploits of Johnny Berhanemeskel, who finished with 22 points, all in a scintillating first half. The second half was a different story, as the Runnin’ Rebels size, speed and athleticism took its inevitable toll. UNLV took a 53-50 lead with about 14 minutes left and never looked back, extending the margin to as much as 20. The Rebels were paced by the 18 points of sophomore Bryce Dejean-Jones and the bruising inside play of freshman Savon Goodman, who scored 17 in only 14 minutes of playing time. At times it was hard to tell who the home team was, as almost 200 UNLV fans made the trip from Las Vegas to follow the team on their four game exhibition tour. The Rebels’ partisans made their presence felt, routinely jeering at perceived bad calls and even starting a “Rebels, Rebels!” chant in the first half. Unfortunately for fans in the nation’s capital, UNLV took the court without its two highly regarded Canadian prospects, Anthony Bennett of Brampton and Khem Birch of Montreal. Bennett, a 2012 McDonald’s All-American, was not cleared to play for UNLV this upcoming season until July 27 and therefore didn’t have time to complete the three course credits required to play in the Canadian exhibition tour. He is expected to be eligible once the regular season starts in November. Birch, himself a 2011 McDonald’s All-American, will not be eligible to play until December after transferring from Pittsburgh last year. Birch, who averaged 4 points, 5 rebounds and nearly 2 blocks in limited minutes with Pittsburgh last year, figures to form part of an imposing frontline with fellow Canadian Bennett, a top 10 recruit from the Class of 2012, and Mike Moser, a 6-8 junior who was First Team All-Mountain West last year. For Berhanemeskel and the Gee Gees, playing against one of the top teams in the NCAA is an exciting opportunity. The Rebels will travel to Montreal for meetings with Laval and McGill on Monday and Tuesday before heading back to Las Vegas. The Gee Gees will get another crack at an NCAA opponent when they face the Northeastern Huskies on Monday night at 7 p.m.
Julius: Carleton Won National Title in August, Johnny Berhane Snubbed? + more! Abu Kigab – HIGHEST MOTOR in the COUNTRY? BREAK OUT Canadian Prospect!